Newspaper clipping from the February 27, 1947 edition of the Los Angeles Examiner. 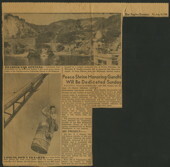 The clipping features an article about the visit of Krishna Nehru Hutheesing, Prime Minister Nehru's sister, and her husband Raja Hutheesing to L.A.
"Peace Shrine Honoring Gandhi Will Be Dedicated Sunday"
Clipping from the August 18, 1950 edition of the Los Angeles Examiner containing the article "Peace Shrine Honoring Gandhi Will Be Dedicated Sunday." The article describes the opening of the Self Realization Fellowship Church of All Religions in Pacific Palisades, California.